After a spate of recalls in Denver, should users be worried? It’s hard to say. Because marijuana is still illegal in most places, there’s no official “safe level” of pesticides. Despite fining two marijuana growers and suspending the licenses of two others for using unapproved pesticides, Washington state hasn’t recalled any products for pesticides during the 18 months that legal pot sales have been allowed. The city of Denver, by comparison, recently recalled 19 pot products for pesticides in 19 weeks. Should consumers here in Washington be worried or relieved? It’s hard to say at this point. Professor Allan Felsot at Washington State University said he’s not seeing cause for concern in his research on pesticide risks. Others, such as professor Dave Stone at Oregon State University, say there’s just not enough data. “The most important thing I’d communicate to the public is we don’t know, and you need to know that,” said Stone, director of the National Pesticide Information Center. Much remains unknown because research that’s abundant for pesticides on foods is lacking when it comes to what happens when you heat and inhale such chemicals. It’s a gap caused by the federal prohibition of marijuana, which keeps the Environmental Protection Agency (EPA) from setting safe levels, or “tolerances,” for pesticides in pot the way it does for crops such as apples and hops. In Colorado, pesticide testing is required, but the state hasn’t yet certified labs to handle those tests. Denver’s health department, though, believes products should be tested and recalled if it perceives a risk to consuming them. The city works with one lab, Gobi Analytical, whose methods have been vetted by state officials, said Dan Rowland, spokesman for Denver’s Office of Marijuana Policy. The city doesn’t require pesticide testing. Like Washington, it relies on spot checks and complaints about pesticides that aren’t on the state’s approved list. Washington has approved a 25-page list of pesticides for the pot industry. The state hasn’t mandated pesticide testing because it’s expensive and complicated. Dr. Jeff Duchin, at Public Health — Seattle & King County, noted earlier this year there are “no cases of human illness identified due to pesticides in marijuana.” But Duchin said he’d advise “buyer beware” as we don’t have enough information to conclude there aren’t health risks. Myclobutanil, a fungicide in agriculture, illustrates the uncertainty facing consumers. The EPA has set a tolerance of 1 part per million of the chemical on grapes. But when heated to a certain point, myclobutanil turns to cyanide gas. Regulators don’t know what concentration levels are dangerous in such circumstances. The federal government forbids its use on tobacco. Washington’s Liquor and Cannabis Board (LCB) considers it an unapproved pesticide. Myclobutanil was found at the growing facility of New Leaf Enterprises in Seattle late last year and on plant samples collected by state investigators. The LCB handed down a $2,500 fine last month. But the LCB then allowed New Leaf, parent company of Dama products, to sell the pot because tests found just .05 parts per million of myclobutanil on plant samples. Based on an “action level” — similar to a tolerance — set by the Oregon Health Authority of .2 parts per million of myclobutanil residue, New Leaf’s plants would be allowed in Oregon. WSU’s Felsot said he doubted that myclobutanil would be heated long enough by a pot smoker — or that there would be enough of it left on a plant — to create a dangerous amount of cyanide gas. 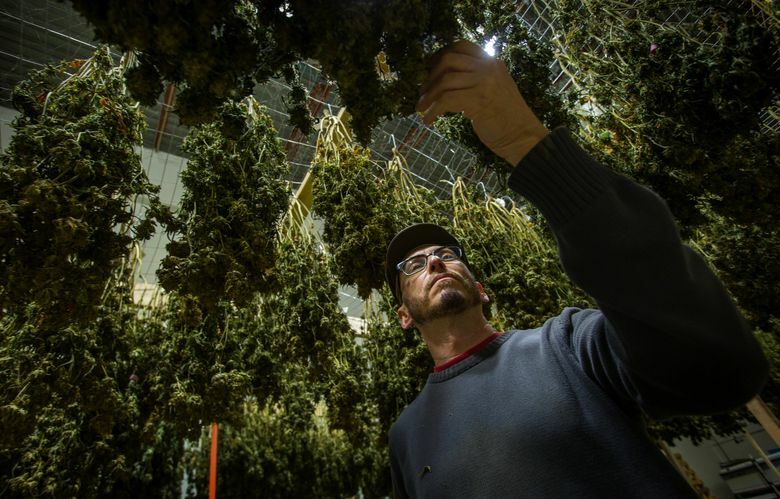 In the state’s new rules for medical marijuana, a harvest or batch will be deemed unusable if it contains “any measurable and positively verified amount” of unapproved pesticide, said Kristi Weeks, policy counsel for the Department of Health. Such a batch must be destroyed. New Leaf executives said they used myclobutanil on “mother plants” when New Leaf was in the medical-marijuana business. When it brought those plants into the recreational system and took cuttings to create clones, the mothers transferred myclobutanil into regulated plants, said company president Boris Gorodnitsky. This is possible with so-called systemic pesticides that don’t just stay on plant surfaces but move into the whole plant. Justin Nordhorn, LCB’s enforcement chief, said he found New Leaf’s explanation plausible, though Felsot said he was skeptical. The LCB ordered New Leaf to destroy its contaminated mother plants. But it released the hold it placed on other New Leaf plants, allowing those to be sold with a warning label. The “negligible” amounts on those plants “wouldn’t put folks in harm’s way,” Nordhorn said, and didn’t justify a recall. Nordhorn said he considered the damage done to New Leaf by the LCB’s monthlong hold. The company laid off about 40 employees and has only rehired about 10 of them, Gorodnitsky said. The LCB also levied a $2,500 fine last month against BMF Washington, a grower in Raymond, Pacific County, after investigating a complaint. Of 17 pesticides inspected at BMF, officials found 12 of them not authorized, according to LCB records. Plant samples taken by inspectors later tested positive for unauthorized pesticides, LCB reported. Nordhorn said he couldn’t go into more detail because BMF, which sells products under the Liberty Reach and Juju Joints brands, is under investigation. A large quantity of marijuana has been placed on hold, he said. LCB spokesman Brian Smith said BMF has requested a settlement conference. BMF believed the food-grade pesticides it was using were allowed, but “we’ve since learned otherwise,” said BMF license-holder Peter Saladino in a statement. Saladino said the pesticides were diluted before use and he is confident tests will show no, or acceptably low, pesticide residues on its quarantined cannabis. Ian Eisenberg, owner of the state’s top-selling store, said Uncle Ike’s in Seattle is pulling BMF products off its shelves. “We’re (expletive) furious,” Eisenberg said. Uncle Ike’s doesn’t sell New Leaf products, he said, but is concerned that oil extracted from their plants might have been sold to other companies to use in products such as edibles. Another Seattle store, Hashtag, is pulling BMF and Dama products, said co-owner Logan Bowers. Anything with unauthorized pesticides will be destroyed, Bowers said, and edibles from other vendors that may contain Dama oil will be held until they are tested and confirmed to be free of unapproved pesticides. Last year, the Way Kool farm in Kitsap County was cited for illegal application of pesticides and began a 10-day suspension in September. All affected product was seized, according to the LCB’s Smith, and the company indicated it was shutting down. Way Kool was allowed to sell off its remaining noninfected product, Smith said. The company has a license but no location to operate at this time, he said. Way Kool did not respond to a request for comment. Herbscapes in Spokane County was also cited for using an unapproved pesticide in June. The company negotiated a six-day suspension, according to LCB records. Nordhorn said a number of factors would go into determining the need for a recall: how much product is in the marketplace; the likelihood of harm to consumers; and making sure the state has a sound legal case.